Antibiotics are chemicals produced by one microbe that inhibit other microbes. Students study the effect of 6 different antibiotics on a Gram-positive bacterium and a Gram-negative bacterium. Exercise requires 3 consecutive days to complete. Perfect for introducing beginner students to microbiology and antibiotic production. This Demonstration Kit, designed for one teacher demonstration or a single student or group, includes comprehensive teacher's manual with reproducible student guide, as well as FREE 1-year access to digital resources that support 3-dimensional instruction according to the NGSS. Note: Kit includes a prepaid coupon to request delivery of perishable materials later at your convenience. Contact us or return the coupon to request delivery of perishables. 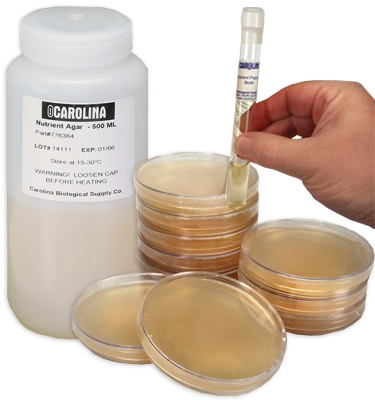 Keep bacteria cultures at room temperature; do not incubate or refrigerate. Refrigerate antibiotic disks until use; do not freeze.